On Monday, I broke my 37-day blogging streak. Since inertia has a momentum of its own, I then failed to blog on Tuesday and Wednesday, too. Now I’m trying to break my non-blogging streak with this teeny post. On Momday morning I finished the next-to-last row of my Sunday Shawl. On Monday night, I realized I had 18 shells on one side and 15 on the other. Oops! That’s quite a large and noticeable mistake – it made the whole shawl uneven and unbalanced. The mistake was actually in the previous row. I’m super-glad I could figure the mistake out; I’m so new to crochet that I wasn’t sure I’d be able to “read” where the mistake it. I know it will be quick to rip and redo – far quicker than if it were knitting – but I’ve let it sit for the past three nights anyway. I’m breaking my non-crochet streak tonight. Here’s hoping I have a finished shawl to show soon! 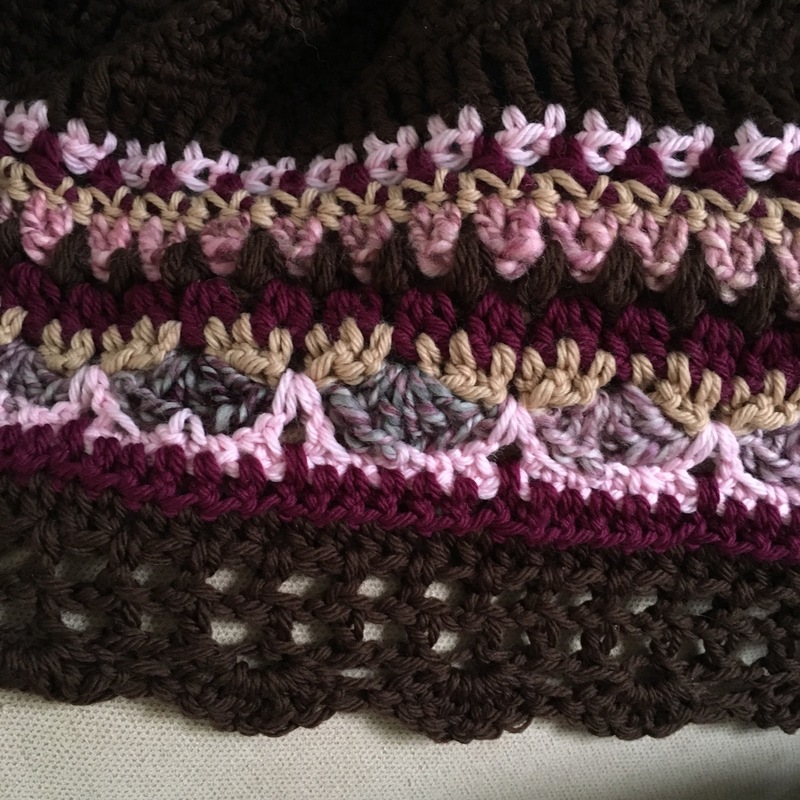 Today has been a very long, very full, very good day, and I’m so glad I got up early and got a few stitches in on my shawl before the day got away from me. I’m sitting down now with a cup of tea and my hook to do a little more before bed. I hope to have more to show you soon! These are all Knit Picks Swish Superwash (plus two handspun yarns). At this point, I’m having a hard time putting this down, but I have to now, because today is a writing day and it’s time to get to work. But I’m getting close to the end, and I’m only falling more in love. This is all KnitPicks Swish (deep stash here), but I threw in some leftover handspun for fun, and I’m loving the results. 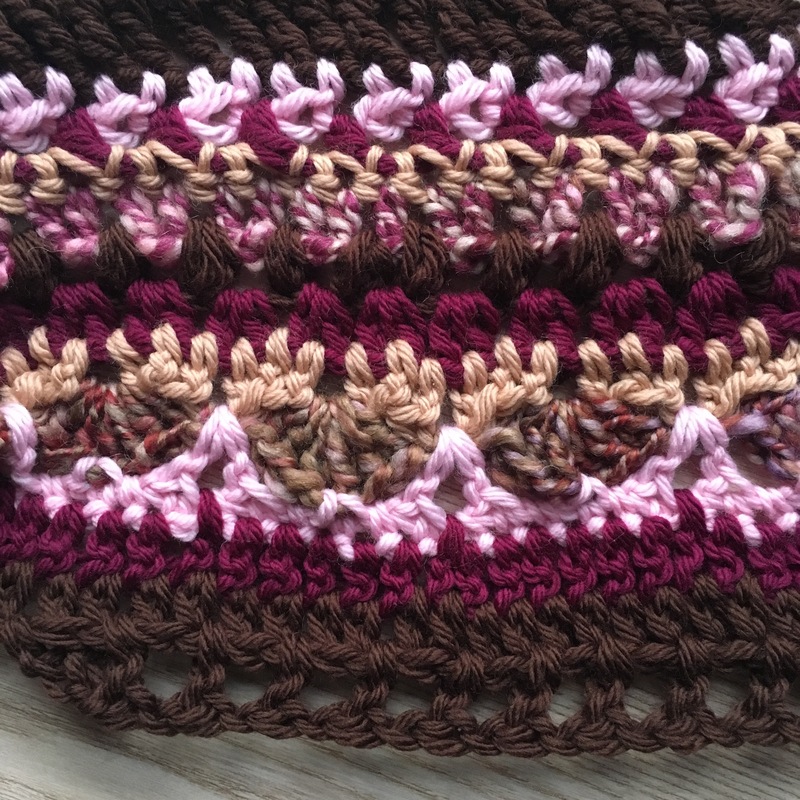 Five rows left – perhaps my reward tonight for finishing my work. But before we jump into that exciting topic, let me first say a huge thank you for your amazing Advent activity suggestions on yesterday’s post!! I haven’t had a chance yet to respond to comments, but they were really wonderful. If you are looking for some ideas to do with your own kids, you really should check out the comments from that post. Thank you so much for everyone who took the time to offer ideas! One of the things I do every year is discover at least one new Christmas cd (either newly released or just new-to-me). A couple years ago it was Cee Lo Green’s “Magic Moment”; this year it’s been Diana Krall’s “Christmas Songs” and a French album of recognizable songs (Marie-Eve Janvier and Francois Breau). Justin Bieber’s Xmas album is pretty fun (hate to admit it). Other ideas: read one Xmas story per day (Norman Rockwell’s anthology is classic, but I also highly recommend Tolkien’s Letters from Santa Clause); wear an ugly Xmas sweater; search YouTube for old Xmas tv specials (He-Man and She-Ra totally have Xmas episodes); go ice skating; put $5 inside a Xmas card and leave it inside a book in a bookstore (this happened to me – I found a card with $5 and a holiday message for the lucky discoverer inside Dickens’ A Christmas Carol in the Ann Arbor Borders, one year). Those are some great ideas, and I especially LOVE the idea of putting money inside a Christmas card and leaving it inside a book in a bookstore and that is DEFINITELY going into the Advent calendar. I hope at the end of the season to give a recap of what I ended up doing. We’ll see if I can keep up with documenting it for myself.